For medical device companies whose products have the potential to provide significant benefits, or produce significant harm for patients, a quality control system helps to ensure that patients are not affected negatively by non-conforming products. Once a medical device company obtains permission to market its product, it can begin manufacturing and shipping medical devices to its customers. When medical devices are manufactured, they must be subjected to the appropriate measures as part of a quality control system whose goal is to ensure that medical devices shipped to the customer meet the manufacturer's specifications. Quality Control vs Quality Assurance - What's the Difference? Quality control and quality assurance are distinct, yet complementary activities that are equally part of an effective quality management system. While the terms are sometimes used interchangeably, it is important for medical device engineers to recognize the difference between quality control and quality assurance. Quality assurance happens before quality control in the overall quality process. The goal of quality assurance is to increase the manufacturer's confidence that medical devices it produces will conform to the required specifications. Quality assurance includes activities that are more "proactive" in nature and focus on the processes used to make the product, rather than on specific products themselves. A medical device quality control system comes into effect once a batch or lot of medical devices have actually been manufactured and are prepared for shipping to the customer. The purpose of quality control is to conduct investigations of product that is ready to ship to the customer and ensure that it meets the required specifications. A quality control system contains more "checking" and "review" activities - rather than focusing on the process, quality control determines whether a given batch of product meets specifications and is ready for sale. What are the Components of a Quality Control System? An effective quality control system should enable a medical device manufacturer to detect and isolate incidences of non-conforming product before they are shipped to the customer - this is the ultimate goal of quality control. A quality control system includes several components that help medical device companies achieve this objective. The FDA mandates that medical device companies should establish detailed criteria for accepting a manufactured product as conforming with the product specifications. Manufacturers also need to document the acceptance status of each product, or batch of products, such that products are not shipped to the customer unless they meet the acceptance criteria. Manufacturers must conduct acceptance activities - inspections, tests, and other verification steps, to ensure that the product conforms appropriately before it can be shipped out of the manufacturing facility. Under 21 CFR Part 820, manufacturers are free to design their own tests for product conformity, but these must be rigorously documented along with any other acceptance activities the manufacturer does to verify product conformance. When a medical device company identifies a non-conforming product as part of its acceptance activities, it should trigger a review of the non-conformance and a root cause analysis to help determine the source. If the non-conformance event can be traced back to a specific root cause in the manufacturing process, the quality manager can implement corrective actions to ensure that the non-conformance does not manifest again in future batches of product. 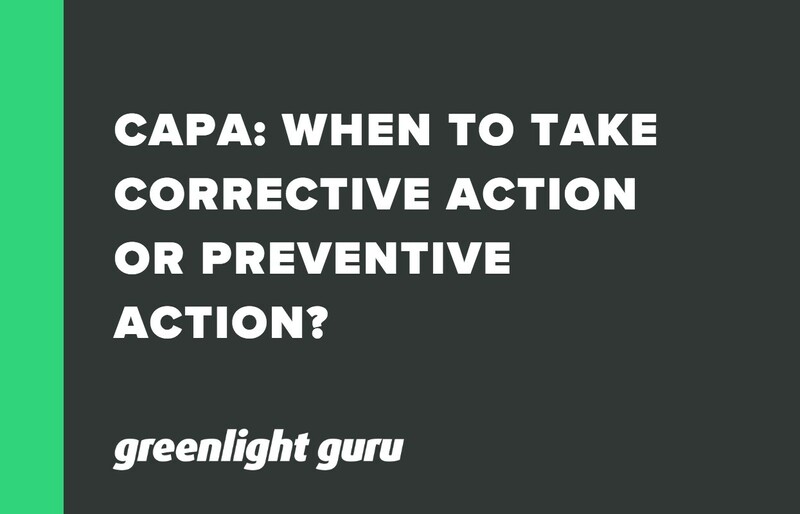 The CAPA process is the most important part of quality control and of the overall quality management system - this system provides a framework for manufacturers to actually improve the process once a non-conformance has been identified. To satisfy the FDA quality system regulations, medical device companies must establish a QMS that supports the mandated quality control system, including acceptance activities, sample testing, and the CAPA process. Greenlight Guru's eQMS Software was designed to support a genuine quality approach to medical device design and manufacturing while providing built-in compliance with the FDA QSR and quality control guidelines. 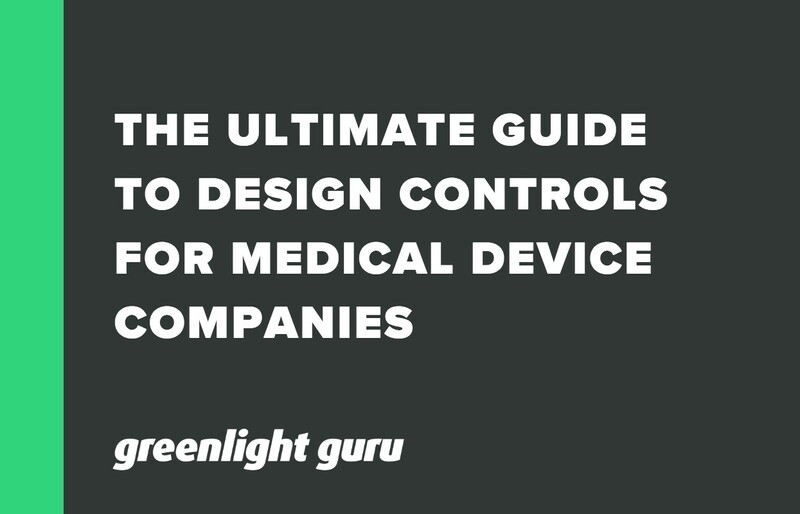 How to start using FDA design controls to your benefit today & implement a process to actual improve your medical device product development efforts. Are you still using paper to manage your QMS? 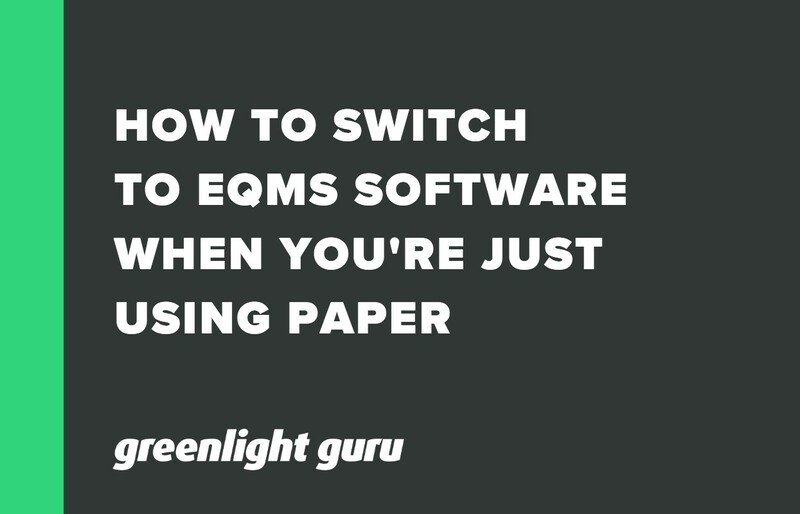 Here’s why it’s time to make the switch to eQMS.